My beautiful and talented friend Anna gave me a ticket to go see a Gala presentation of "Good" one of Viggo's three films at this year's Toronto International Film Festival. Meanwhile my ugly and untallented friend Chris was incapable of getting tickets to the same film. He also failed to charge the camera battery enough to capture my encounter after the film. I spoke to Viggo on the red carped and asked him if he would be in the next Hobbit movie. He said "maybe the second one" and then I told him "I'll see you there". He looked at me a bit oddly and I told him that I would be going to New Zealand for the filming of the Hobbit. Overwhelmed by the contrasting nature of what I had told him Viggo gracefully walked into the screening of his own film. You're probably thinking that's the worst story you've ever read. You've probably met the man yourself. 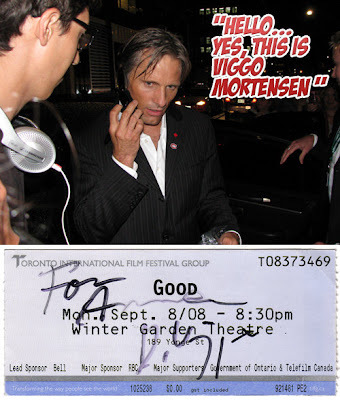 But what you haven't done is have Viggo personally speak to your friend (a huge Viggo fan) by way of cellphone and have him thank the your friend for the ticket. That's what I did. I gave him my cellphone, had him explain who he was and to sign the ticket to a sold-out Gala presentation of Good. I doubt he will remember me... but at least I have a news article about it.